Folks! There’s soooo much to do and so little time. I am not sure when I will finish it all. I just started making the kuswar yesterday and in between managing the kids and the house my work is going at snail’s pace. In the midst of it all I feel guilty for not posting the recipes that have been piling up since ages. 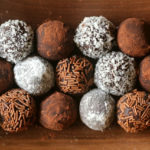 I am not kidding but I still have a few of last year’s recipes to post. So without further ado let me post them today and tomorrow after which I will relaaaaaaaax! You may not see me until next week cuz a girl’s gotta rest! Too much of cooking and staying in the kitchen isn’t gaining me any brownie points in the socialising department. I have a great family, cousins, friends and neighbours I want to spend my time with and share the Christmas cheer! So to all of you my darlings – Have a wonderful Christmas – enjoy the festivities, the bonding, the caring, sharing and all those lovely things that we MUST carry forward to the next year as well. May this Christmas be just a reminder of the reason behind the season! May Jesus fill your lives with happiness today and always!! 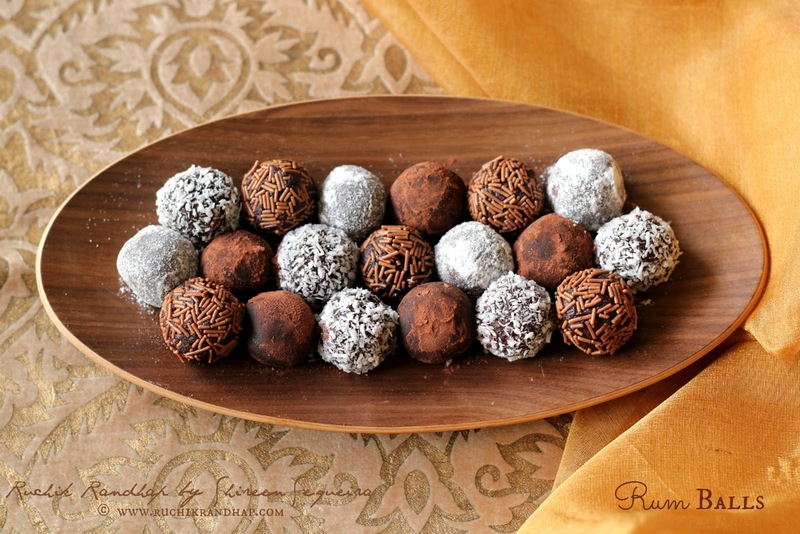 Rum balls are those little treats that you can serve during the festive season when you are not in the mood to make something too fancy! A great way to use up leftover sponge or plum cake! 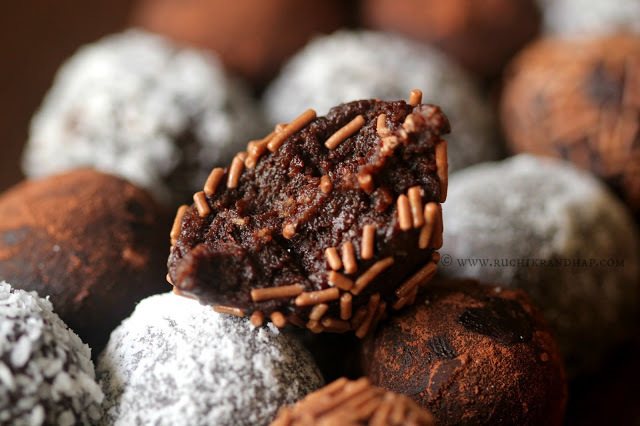 Place the cake crumbs, ganache, dessicated cocoa in a large bowl. Add the rum to taste (to adjust consistency) and mix everything to form a thick, semi sticky dough. 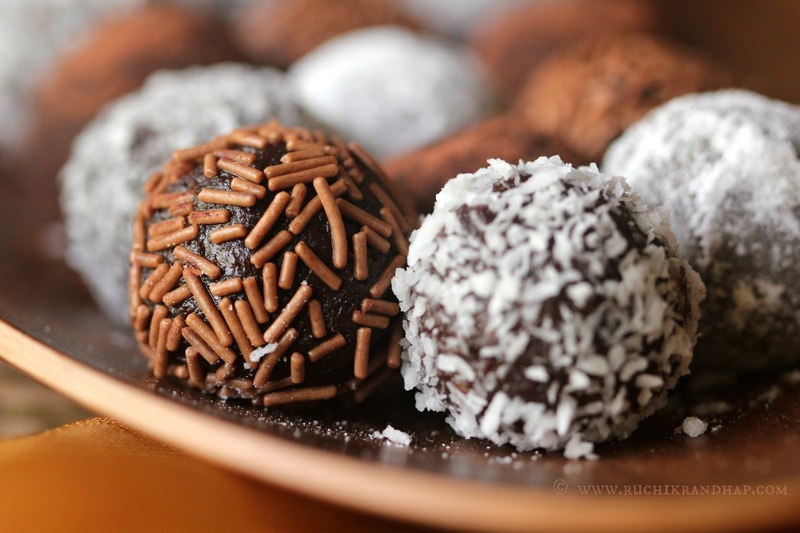 Adjust sweetness by adding the icing sugar or condensed milk as required. Place the items to roll/coat in different plates and keep it ready. Pinch out small portions of the dough and roll into balls, then coat with the desired decorative coating. Serve! 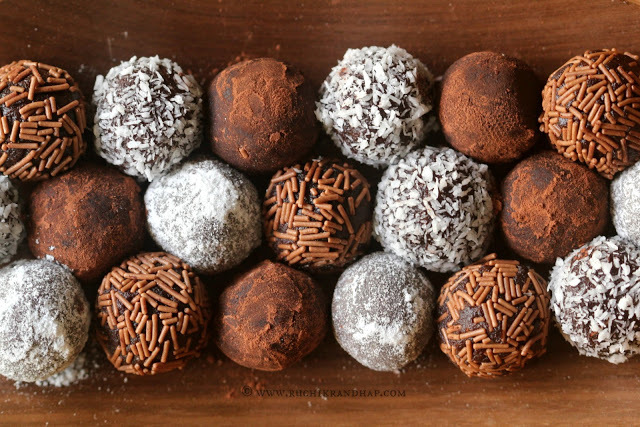 You can store the rum balls in an airtight container for upto 1 week in a cool place.